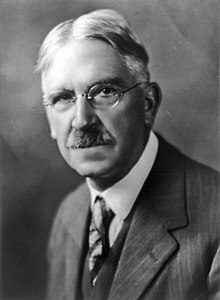 John Dewey (/ˈduːi/; October 20, 1859 – Juin 1, 1952) wis an American filosofer, psychologist, an eddicational reformer whase ideas hae been influential in eddication an social reform. Dewey is ane o the primary figurs associatit wi the filosofie o pragmatism an is conseedert ane o the foonders o functional psychology. A Review of General Psychology survey, published in 2002, ranked Dewey as the 93rd maist citit psychologist o the 20t century. A well-kent public intellectual, he wis an aa a major vyce o progressive eddication an liberalism. Awtho Dewey is kent best for his publications aboot education, he an aa wrote aboot mony ither topics, includin epistemology, metapheesics, aesthetics, airt, logic, social theory, an ethics. This page wis last eeditit on 26 August 2016, at 20:54.